If we want things in our lives, we have to plan for them. So plan to be a leader. What If Every Day Was Your First Day at Work? What if, says Drew Dudley, we believed that leadership wasn’t just for those in charge? What if we embraced our ability to lead, no matter our school grades or pay-grade? As he describes in his fortifying and action-oriented talks, individuals and organizations alike can create “cultures of everyday leadership.” But nothing happens by accident. We have to plan for leadership, and Dudley tells us how. Author of This Is Day One, which turns the inspiration of his talks into a practical, how-to guide for developing a leadership action plan, Drew Dudley is the former director of one of the largest university leadership development programs in Canada. Dudley nevertheless embraces the idea that “leadership cannot really be taught. It can only be learned.” As he demonstrates in his wildly popular TED and TEDx Talks, we can all be students of leadership—so long as we design, and stick to, a strategy. As Dudley says in The Wall Street Journal bestselling This Is Day One, “Leadership is accessible. In fact, most of the leadership on the planet is delivered by people who don’t see themselves as leaders.” This Is Day One contains years of research and stories to prove it, as well as the tools, guides, and step-by-step processes designed to reveal your core leadership values, embed them into your daily behavior, and drive improved performance, productivity, impact and happiness. As in his book, Dudley’s talks help us understand leadership in a more nuanced, practical, and hopeful way. He argues that we too often make leadership into something bigger than us, or beyond us. We make it about money, fame, titles and influence, and therefore something reserved for a select few. Instead, Dudley insists our organizations and communities are stronger when we embrace the idea that there is leadership we are all capable. If you don’t know where to begin, ask yourself “What would the person I want to be do in this situation?,” he says. Dudley’s keynotes blend world-class storytelling with practical insights on how to develop and recognize leadership—in ourselves, our families, our organizations, and our communities. He has spoken to over 250,000 people on 5 continents, been featured on The Huffington Post, Radio America, Forbes.com, and TED.com, where his TED talk was voted “one of the 15 most inspirational TED talks of all time” and has been viewed millions of times around the web. TIME recently named the talk one of their “seven speeches that will make you a better leader.” His work with some of Canada’s largest schools, corporations, and government agencies has led to him being called “one of the most motivating and inspiring speakers on leadership out there right now” (Dr. Brian Harrington, Oxford University). Drew Dudley's presentation was the highlight of the three days for me—he was outstanding. He was an excellent speaker. He was thought-provoking and really helped to make a connection beyond theory to action. After attending his keynote, I was inspired to engage in the value activities he discussed. He was extremely inspiring personally as well as professionally. I learned useful tools that I can use everyday at work and at home. Leadership author and educator Drew Dudley has asked that question to thousands of audiences around the world, and in fewer than 1% of those audiences were the majority of people willing to call themselves leaders. That’s a problem, and this session will focus on how to solve it. In this engaging and empowering keynote, Drew aims to demonstrate that there is a form of leadership to which we should all aspire: one that is driven by a daily commitment to acting on six key leadership values: impact, courage, growth, empowerment, class and self-respect. Drew will provide six simple questions that comprise “The Leadership Test,” and while the questions may be simple, the behavioural changes they generate build better careers, stronger organizations, and more fulfilling lives. A commitment to passing “The Leadership Test” turns those six values into more than just words, and changes how you treat yourself and the people around you. Drew will walk participants step-by-step through the discovery of their personal leadership values, demonstrate how those values can be translated into daily behaviours, and show how values-based decision-making leads to individual and organizational success. At each stage, Drew will draw on 15-years of personal leadership stories and insights to show how this process led him through battles with alcohol, obesity, and personal tragedy. Honest, engaging, and above all practical, this presentation will help you understand what your Day One needs to look like, remind you why you’re a leader, and make clear what you can do to be a better one, starting today…on Day One. It’s on that premise leadership speaker and author Drew Dudley has built this keynote, but he knows all to well that fostering that self-respect is a lot easier said than done. In 2010, Drew was fresh off delivering what would be voted one of the “15 most inspirational TED talks of all time” and traveling the world delivering keynotes that led one Oxford University professor to proclaim him “the most motivating and inspiring speaker on leadership out there right now”. 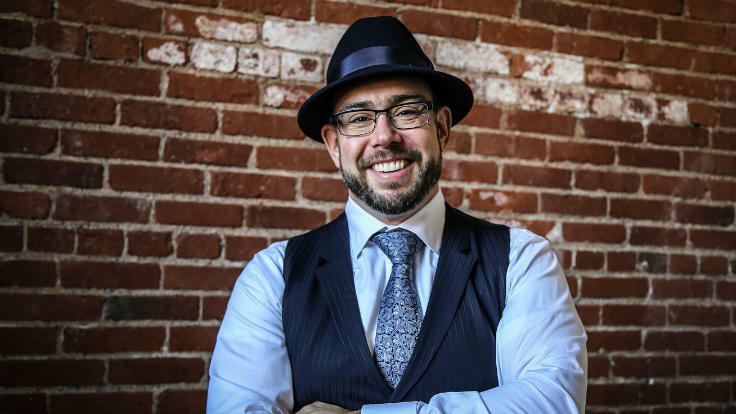 While his professional career was empowering others to embrace their leadership, Drew was struggling off the stage: battling alcohol addiction, undiagnosed bipolar disorder and a lifestyle that had ballooned him to over 300 pounds. In this keynote, Drew melds self-care insights from all over the world with his own story to present six strategies for embedding self-care and building self-respect into your personal leadership philosophy. Over the past eight years these strategies helped him achieve and maintain sobriety, lose 100 pounds, manage his mental health, and most recently, process a profound personal tragedy. A presentation that acknowledges the dark parts of life and work with humour and compassion, this practical exploration of self-awareness, forgiveness, resilience and healing will remind you that we cannot lead others until we can lead ourselves, and show you how great leaders know how to put themselves first while still serving others.